Maybe I am on to a subject/theme with the oil paint sticks. I have never really been drawn to using clouds as a subject matter for painting…I think because I see a lot of them by other painters. However, it might be a good learning subject for me. They are difficult! But, they are also fun, open to interpretation and I have lots of photo resources in my personal library! Not only will I learn a lot with the medium, I will have a bunch of pieces that look like they work together! I still don’t know how important that is, but the subject matter will make it happen anyway. I wonder how many of these I will actually do before I get distracted. Great tip from my friend Susan Renee Lammers for adding color into the clouds…I am not sure I didn’t overdue it, but I feel good about the direction it took me! 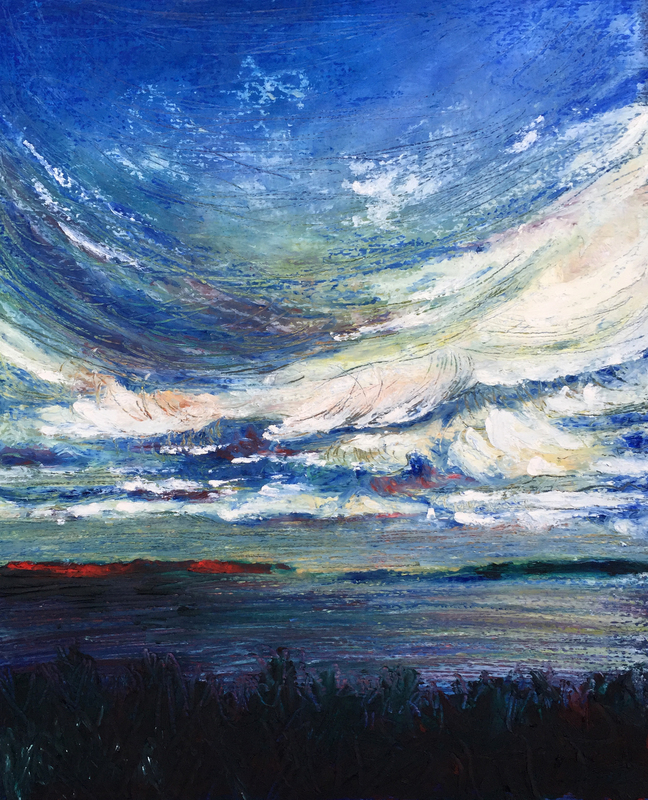 This entry was posted in #everdaymatters, art, artwork, clouds, oil paint, painting, small painting and tagged #everydaymatters, art, art experiments, artist, arts, clouds, cloudscape, oil paint sticks, penobscot bay, small painting. Bookmark the permalink. thanks Karen. It’s a challenge going back from brand to brand. I have more color range in the Shiva, so I keep going back to them…but they are more difficult to work with. I think I am going to try and start mixing some colors next and maybe even use a brush! So far, I am just using my fingers, paper towels and a palette knife.